Chuir rialtas na Breataine an tAcht um Rialtas na hÉireann i bhfeidhm ar 23 Nollaig 1920. Bhí an tAcht bunaithe ar an gCeathrú Bille um Rialtas Dúchais na hÉireann. Reachtaíodh é le cur leis an ngealltanas a bhí tugtha ag Rialtas na Breataine le fada Rialtas Dúchais a bhronnadh ar Éirinn, tar éis an Chéad Chogadh Domhanda. Bhí an tAcht bunaithe ar an tuiscint a bhí ag David Lloyd George agus Walter Long (ceannaire na nAontachtóirí i gCúige Uladh) ar pholaitíocht na hÉireann roimh an gcogadh. Ach idir an dá linn, d'athraigh an suíomh in Éirinn an oiread agus nár leor an tAcht leis na hÉireannaigh a shásamh. Bhí na Náisiúnaithe Éireannacha ag éileamh neamhspleáchais agus Poblachta faoin am seo. B'iad Sinn Féin an páirtí ba láidre in Éirinn, agus ní ghabhfaidís leor le Rialtas Dúchais de réir an tsean-sainmhínithe. Mar sin, ar an 23 Nollaig 1920, nuair a ritheadh an bille, bhí sé glan as dáta cheana féin. Rinneadh a lán iarrachtaí i rith na naoú haoise déag agus i dtús na fichiú haoise le féinrialtas teoranta, nó Rialtas Dúchais, a bhaint amach d'Éirinn. Sa bhliain 1886, dhiúltaigh Teach na dTeachtaí don chéad Bhille um Rialtas Dúchais na hÉireann faoi bhrú na stocaireachta a bhí idir lámhaibh ag na hAontachtóirí agus na hOráistigh. Chuaigh scoilt ar an bPáirtí Liobrálach de dheasca an bhille seo. Sa bhliain 1893, rith Teach na dTeachtaí an dara Bille um Rialtas Dúchais, ach ansin, chros Teach na dTiarnaí é, agus ní dheachaigh sé ar leabhar na reacht riamh. Sa bhliain 1911, áfach, chaill Teach na dTiarnaí a chumhacht crosta, agus mar sin, nuair a chuir Páirtí Parlaiminteach na hÉireann an tríú Bille um Rialtas Dúchais na hÉireann faoi bhráid na Parlaiminte sa bhliain 1912, ní raibh cead ag na Tiarnaí é a chur ar ceal a thuilleadh. Scéal eile é go raibh siad in inmhe é a chur ar fionraí go ceann dhá bhliain. Bhí an chuma ar Éirinn go bhféadfadh cogadh cathartha briseadh amach ansin pé nóiméad, agus mar sin, d'fháiltigh Rí Seoirse a Cúig ceannairí na nAontachtóirí agus na Náisiúnaithe chuige i Mí Iúil 1914 le haghaidh comhchainteanna. Ní raibh toradh ar bith ar an gcruinniú seo (nó Comhdháil Phálás Buckingham, mar a thugtar air). Bhí na Náisiúnaithe ag éileamh Rialtas Dúchais d'oileán na hÉireann go léir (agus Liobrálaigh Shasana ag tacú leo) agus na hAontachtóirí ag éileamh go bhfágfaí Cúige Uladh taobh amuigh den fhéinrialtas. Nuair a cuireadh leasú leis an mBille a cheadaigh do mhuintir Uladh tarraingt as an Rialtas Dúchais go sealadach, tugadh Aontú an Rí don Bhille, agus chuaigh sé ar leabhar na reacht, díreach nuair a bhí an Chéad Chogadh Domhanda tosaithe. Bhí an tAcht le cur i ngníomh i ndiaidh an chogaidh, agus dóchas ag gach duine nach mairfeadh an cogadh féin ach tamall beag. Le linn an chogaidh féin, rinne an Príomh-Aire Herbert Henry Asquith dhá iarracht leis an Acht a chur i ngníomh. Ar dtús, i mBealtaine 1916, theip air aontú a bhaint as na hAontachtóirí. Ansin, sa bhliain 1917, chuir sé gairm chruinnithe ar Chomhdháil na hÉireann, comhthionól a raibh idir Aontachtóirí agus Náisiúnaithe air, agus John Redmond ina Chathaoirleach air. Ní raibh an Chomhdháil seo féin in ann ach tuairisc a eisiúint le moltaí faoin "tuiscint" cheart ar na cúrsaí conspóideacha. Bhí an Rialtas, a raibh David Lloyd George i gceannas air anois, dírithe ar an Rialtas Dúchais a chur i ngníomh pé scéal é, le taobhshúil ar thuairisc na Comhdhála. Cheap comh-aireacht na Ríochta Aontaithe coiste ar leith, Coiste na hÉireann, le marana a dhéanamh ar na ceisteanna seo, agus ba é Walter Long, polaiteoir Aontachtach, a bhí ina chathaoirleach ar an gcoiste. Mhol Coiste na hÉireann go mbunófaí dhá shlánaonad féinrialaitheacha in Oileán na hÉireann, mar atá, Deisceart Éireann agus Tuaisceart Éireann. Chuir Teach na dTiarnaí an leasú seo leis an mBille, ach nuair a chuaigh an Bille faoi bhráid na Parlaiminte le haghaidh an Dara Léamh i Márta 1920, bhí cuid mhór de na Feisirí Éireannacha barúlach nach bhféadfaí comhréiteach ceart a bhunú ar mholtaí Choiste Long. Chaith an Pharlaimint tréimhse fhada ag díospóireacht faoi impleachtaí airgeadais an Bhille, ach ansin, thug formhór mór na bhFeisirí a bhfaomhadh don Bhille sa Tríú Léamh ar an 11 Mí na Samhna 1920. Dhiúltaigh a lán Feisirí Éireannacha don Bhille, ina measc an tAontachtóir Maurice Dockrell agus an Náisiúnaí Seosamh Ó Doibhlin. Le linn an Chéad Chogadh Domhanda, d'athraigh atmaisféar polaitiúil na hÉireann go mór. Sa bhliain 1916, d'éirigh Óglaigh na hÉireann agus Arm Cathartha na hÉireann amach in aghaidh na nGall i mBaile Átha Cliath. Chuaigh aisfhreagra na Sasanach ar an Éirí Amach glan oscartha thar fóir, agus iad ag cimiú náisiúnaithe nach raibh baint ar bith acu leis an Éirí Amach. Dá réir sin, chuaigh meon na nÉireannach chun radacachais, forbairt ar chuir Géarchéim an Choinscríofa 1918 tuilleadh luais léi. Tháinig Sinn Féin chun tosaigh, agus an Páirtí Parlaiminteach ag cailleadh tábhachta go tiubh mar ghuth an náisiúnachais Éireannaigh. In Olltoghcháin na bliana 1918, bhain Sinn Féin amach trí cinn déag is trí scór de na suíocháin pharlaiminteacha, cúig cinn thar chúig scór, a bhí ag dul d'Éirinn, agus tháinig siad le chéile beag beann ar pharlaimint Westminster, mar pharlaimint neamhspleách Éireannach, nó Dáil Éireann. Ghair siad stát neamhspleách d'Éirinn, nó Poblacht na hÉireann. Ar a lán cúiseanna éagsúla chaith na Feisirí Aontachtacha go léir vóta in aghaidh an Achta. B'fhearr leo go bhfanfadh iomlán Chúige Uladh taobh istigh den Ríocht Aontaithe, agus níor ghlac siad le stáitín féinrialaitheach Thuaisceart Éireann ach amháin mar shop in áit na scuaibe. Mar sin, nuair a tugadh an Rialtas Dúchais isteach, bhí a phort seinnte roimh ré. nó ní bheadh na Náisiúnaithe Éireannacha sásta ach le neamhspleáchas iomlán. Bhí, fiú, fórsaí armtha Phoblacht na hÉireann ag cur cogaidh ar na Sasanaigh cheana leis an gcuspóir seo a bhaint amach. Ba é an tAcht seo a rinne críochdheighilt ar Éirinn. 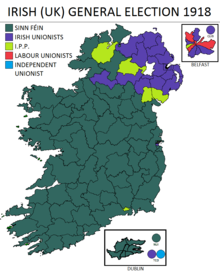 Dealaíodh sé chontae - an Dún, Aontroim, Ard Mhacha, Fear Manach, Doire agus Tír Eoghain - ón gcuid eile den tír, chomh maith leis an dá bhuirg úd Béal Feirste agus Doire. Ba é seo uasmhéid an limistéir ina bhféadfadh na hAontachtóirí an tromlach a choinneáil slán, ach san am céanna, fágadh cuid mhaith Caitlicigh i bhFear Manach agus i dTír Eoghain taobh istigh den teorainn. De réir an Achta, bheadh a rialtas féin ag Deisceart Éireann taobh theas, agus rialtas eile ag Tuaisceart Éireann, nó an sé chontae seo. Bhí sé ceaptha go mbeadh Fear Ionad an Rí - nó an tArd-Leifteanant - os cionn an dá stát in Éirinn ó thaobh na cumhachta feidhmithí de. Bheadh an t-údarás feidhmitheach dílsithe don Choróin, agus ní bheadh parlaiminteachas ar bith ann. Mar sin, bheadh Fear Ionaid an Rí ag ainmniú na nAirí Rialtais thar cionn an Rí, beag beann ar pharlaimint an dá stát. Bhí Comhairle ar leith - Comhairle na hÉireann - le cur ar bun freisin le caidreamh an dá pharlaimint a chomhordú. Tháinig parlaimint an Tuaiscirt ar an bhfód de réir an Achta, ach nuair a vótáladh na feisirí isteach ar pharlaimint an Deiscirt, staon an chuid ba mhó acu ó chruinniú bunaidh na parlaiminte sin. Ní raibh ach beirt Aontachtóirí ó Choláiste na Tríonóide i láthair ansin. Chruinnigh na feisirí eile in áit dá gcuid féin, agus d'fhógair siad gurbh iadsan Dáil Éireann, nó parlaimint Phoblacht neamhspleách na hÉireann. Níor thionóil parlaimint an Deiscirt ina hiomláine ach aon uair amháin. Nó nuair a bhí an Conradh Angla-Éireannach sínithe, bhí faomhadh na parlaiminte seo ag teastáil ar chúiseanna foirmiúla. Mar sin, tháinig Teach Teachtaí Dheisceart Éireann le chéile aon uair amháin le glacadh leis an gConradh, agus ansin, scoireadh ar an toirt é le go bhféadfadh an Tríú Dáil teacht ina áit. Tugadh an leathanach seo cothrom le dáta an 23 Nollaig 2017 ag 21:11.